Acrosser 2018 Product Catalog selects its latest major industrial product lines: In-Vehicle Computer, Gaming Platform, Networking Appliance, Embedded SBC, Fanless Embedded System, and Panel PC. Acrosser 2017 Product Catalog selects its latest major industrial product lines: In-Vehicle Computer, Gaming Platform, Networking Appliance, Embedded SBC, Fanless Embedded System, and Panel PC. Acrosser Network Management Platform are specifically designed for Network Management Platform, Network security, Unified Threat Management(UTM), Firewall, UTM, VPN, VOIP applications. Acrosser 2016 Product Catalog selects its latest major industrial product lines: In-Vehicle Computer, Gaming Platform, Networking Appliance, Embedded SBC, Fanless Embedded System, and Panel PC. 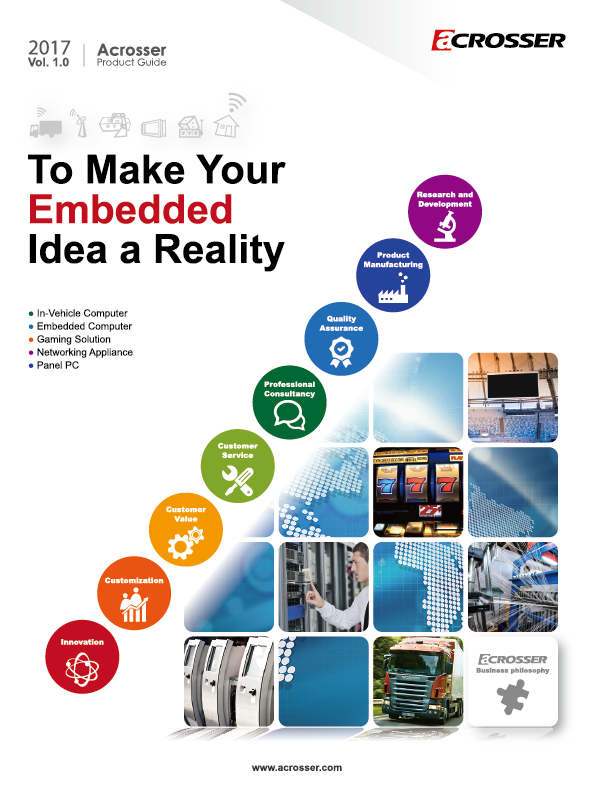 Acrosser's 2015 Product Catalog selects its latest industrial endeavor on four major product lines: embedded SBC, In-Vehicle computer, gaming solutions, and networking appliances. Meet our new solutions now! Acrosser hand-picked 6 classic illustrated case studies from our clients. Find out how in-vehicle computer help our customer to win their business right now! 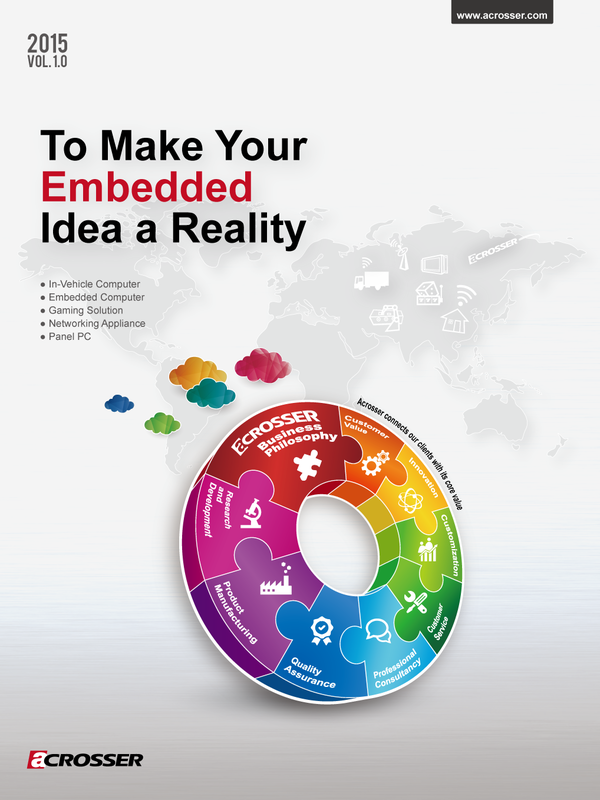 Acrosser's 2014 Product Catalog selects its latest industrial endeavor on four major product lines: embedded SBC, In-Vehicle computer, gaming solutions, and networking appliances. Meet our new solutions now! Acrosser's rugged vehicle PC is stable, durable and reliable for fleet management. Visit our brochure and optimize your business! Acrosser's 2013 Product Catalog stresses its emphasis on in-vehcile systems, and other product lines include: embedded SBC, gaming solutions, and networking appliances. Featuring its award-winning products on "Taiwan excellent 100 on ITS/telematics Award". The book also illustrates how Acrosser provides thorough business solutions on the competitive In-Vehicle computer industry. Acrosser's In-Vehicle Computer has been widely accepted in many industries on a commercial basis. Acrosser‘s product matrix provides quality-assured products, and complete Intel CPU support lists for reference. Acrosser’s off-the-shelf All-in-One gaming Box ACE has already integrated with the features required for any type of gaming machine. Acrosser In-Vehicle Solutions are designed with innovative thought, especially for applications within a vehicle such as Advertising, Fleet management, Safety and security, Telemetric solution and location globalizing. Acrosser’s Console server is the world’s first x86 based with 16 COMs, 6 LAN,1 Console Port,2K Vrms Protection,15KV ESD Protection,1U Fanless. That is a mileston Acroser has achieved in advanced industrial automation field. Acrosser's Panel PC/Touch screen PC/PPC product line offers a wide range of "All-In-One" integrated solutions. This would include Panel PCs, Human Machine Interaces(HMI), and industrial Display Monitors. Acrosser's Fanless embedded computers/ Embedded Systems/ Computing platform not only allow you to reduce your “Total Cost of Ownership” but also help your embedded ideas become a reality.